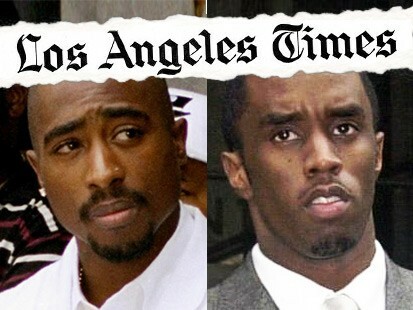 It looks like the L.A.Times has had to apologize for a false story they published last week that implicated rapper Sean "Diddy" Combs in a 1994 assault on Tupac Shakur during a so-called rapper's war hit. The L.A. Times had to do an internal investigation when the website The Smoking Gun published an account detailing that the documents the L.A.Times used to base their story upon were forged and that the person who forged them was a well known con man on the rap music scene who pulled one over on the LAT -- big time! Yeah, the L.A.Times has an awful lot of egg on its face with this mess. The AP reports that TSG's proof makes the LAT look like a bunch of bumbling idiots. The Smoking Gun said the documents seemed phony because they appeared to be written on a typewriter instead of a computer, included blacked-out sections not typically found in such documents, and other reasons. The Smoking Gun story claims the documents were created by a convicted con man and music fan with a history of exaggerating his place in the rap music world. Originally the Times claimed its story was based on FBI records, interviews with people who were there at the time, and some FBI informants. Curiously enough though, none of the sources were named in the LAT story, the whole thing being based on the ever-famous "unnamed sources." Naturally Sean "Diddy" Combs denied he had any part in the attacks on Shakur and it's no wonder he'd say that because the LAT piece was full of puff, Daddy. The main point of this story is that the LAT really dropped the ball here. TSG has a very extensive report revealing how badly the Times did on this one forcing the LAT to admit their mistake. It certainly leads one to wonder how many other stories they've published in the past are as badly researched and sourced as this one? Now, while we here on Newsbusters lament the loss of stature that this story might cause the LAT in particular and the MSM in general, we can't help harkening back to a little story about president Bush's Nat'l Guard service that Dan Rather tried to foist on the American public that also turned out to be based on forged documents. That CBS report was widely discredited by just about everyone, too. I have to say, though, that I don't quite recall Dan Rather's big apology on that one. So, apparently the L.A.Times is all prepared to apologize to some thug rappers for a story based on forged documents, but the president gets bupkis from a forged document story that defamed him. I think the paper needs to take a broader look at Philips’s work. I’ve had concerns in the past about his failure to disclose conflicts in stories he has written — for example, see here. But a quick apology may have the effect of sweeping any such investigation under the rug. [...] This story should not be viewed in isolation. Let’s take a look at the bigger picture. Russell Poole, the LAPD homicide detective (now retired) who investigated Biggie Smalls’s murder, believes that Suge Knight is responsible for both Smalls’s and Tupac Shakur’s murders. Poole believes that Knight planned Smalls’s murder with LAPD officer and Bloods gang member David Mack, who is now incarcerated in federal prison for bank robbery. Poole says that LAPD blocked his investigation whenever it led to possible corruption or criminal involvement by LAPD officers. For years, Biggie Smalls’s family has pursued a civil case against the LAPD on Poole’s theory. Randall Sullivan reported the details of Poole’s theory in a Rolling Stone article and in a book called LAbyrinth. Chuck Philips has had a long association with Suge Knight.